The new IBM POWER8 processor, available at frequencies of 4.024 GHz, 4.190 GHz, and 4.350 GHz. This publication is for professionals who want to acquire a better understanding of IBM Power Systems™ products. 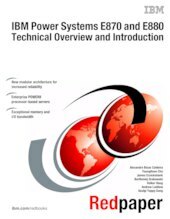 This paper expands the current set of IBM Power Systems documentation by providing a desktop reference that offers a detailed technical description of the Power E870 and Power E880 systems.